An available class-leading 15 unique camera views1, including an industry-first clear trailer view, help optimise the driver’s view around the truck and compatible trailers to provide added confidence when towing. The revolutionary transparent trailer feature uses the tailgate-mounted camera and an available accessory camera mounted on the rear of the trailer. The resulting display helps the driver to virtually see through the trailer, a benefit when navigating parking lots, merging into traffic or making tight turns. The ProGrade Trailering System also includes an in-vehicle Trailering App with Trailer Light Test, Trailer Electrical Diagnostics, Trailer Tire Pressure and Temperature Monitoring, Pre- Maintenance Reminders and Departure Checklist. Many of the Trailering app’s functions, including the lighting test and pre-departure checklist, are also available with the myGMC mobile app, a feature that offers excellent convenience when outside the truck or trailer. All-new Park Grade Hold Assist enhances hill hold by using braking effort at each wheel for an extended period. It has an integrated trailer brake controller that works with the trailer profile in the Trailering App to recall a specified trailer’s most recent gain setting. Tow/Haul mode that remains engaged on the next key-on cycle, for up to four hours; includes a reminder the feature is employed. Digital Variable Steering Assist that dynamically optimises power steering according to driving scenarios, including trailering and enables features like road pull compensation. Trailering Info Label placed on the driver’s door jamb that calls out the truck’s specific trailering information, including the curb weight, GVWR, GCWR, maximum payload, maximum tongue weight and rear GAWR. 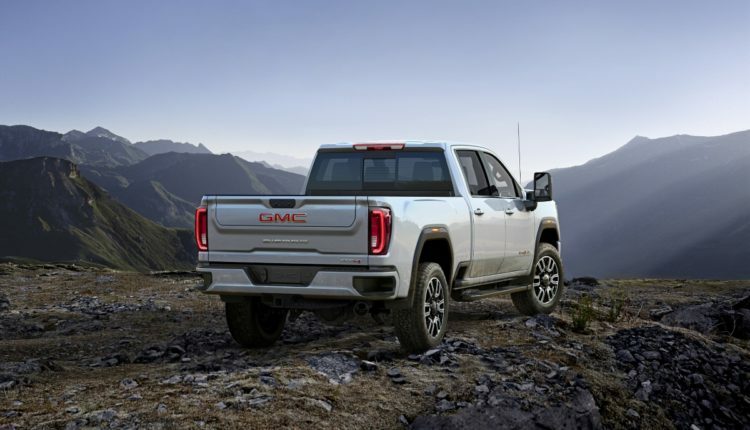 The 2020 Sierra HD has a commanding, powerful design rooted in a new architecture with larger proportions. 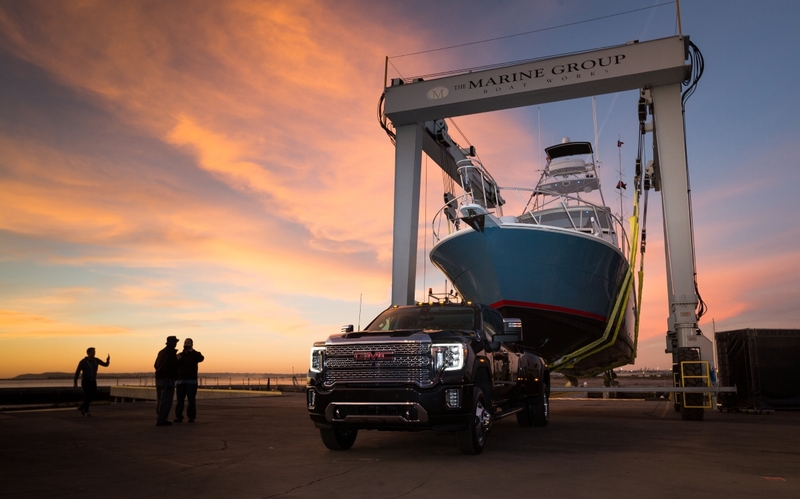 It is taller and longer, with a more confident stance defined by a bold design that epitomises GMC’s signature refinement and technologically driven attention to detail. 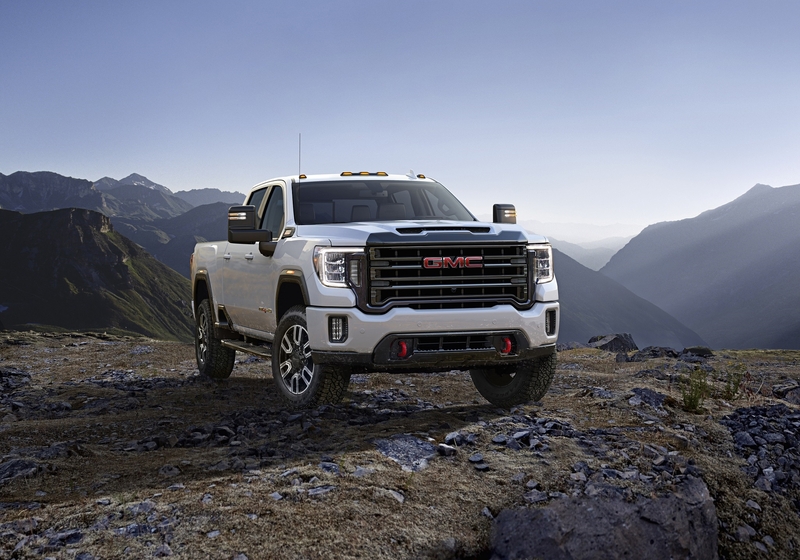 The all-new Sierra HD is highlighted by new signature lighting, including prominent “light blades” that deliver LED illumination for the daytime running lamps. LEDs are also used for the headlamps, taillamps, available fog lamps and other illuminative elements, including the open roof marker lights standard on all dual-rear-wheel HDs and all Sierra HD Denalis except where prohibited by law. Inside, the Sierra HD’s new interior has best-in-class front head- and legroom (maximum), with Crew Cab models. A higher seating position complements the truck’s taller profile to offer a particular view from behind the wheel. 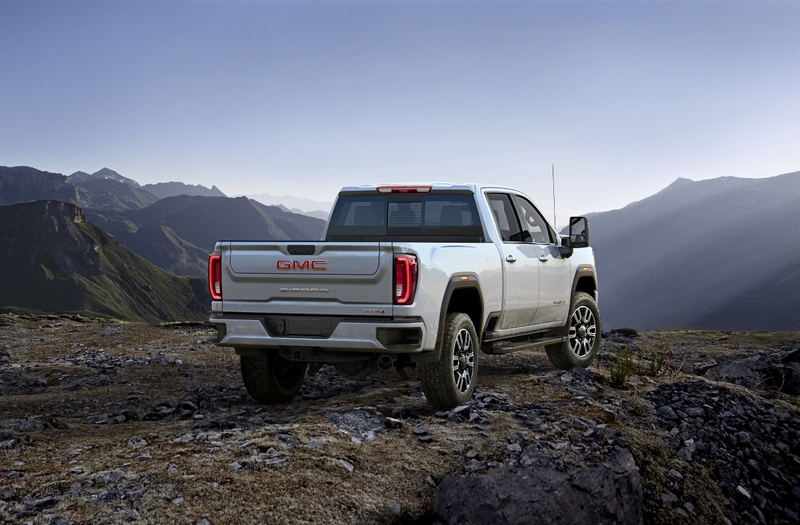 Additionally, optimised ergonomics emphasise easy, intuitive interaction with the vehicle’s available technologies, such as a heavy-duty segment-first head-up display and GMC’s latest touchscreen infotainment systems. Denali-exclusive materials — including premium leather-appointed seating, authentic open-pore wood trim and dark-finish aluminium decor — raise the interior’s refinement. The leather appointments have a distinctive, large-pebbled grain with a contrasting stitch pattern that is premium in appearance and touch without sacrificing durability, and the wood trim features an open-pore texture evocative of hand-planed furniture. 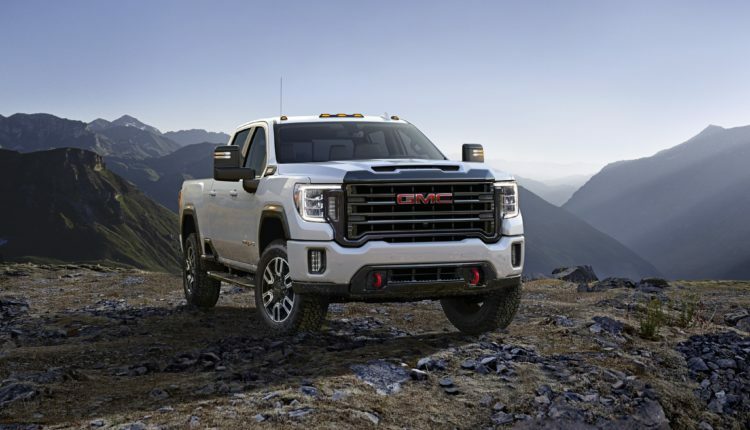 The all-new 2020 Sierra Heavy Duty AT4 continues the AT4 brand’s growth with a distinctive off-road identity to complement its robust HD capability. Driven by dark chrome exterior finishes and contemporary detailing, Sierra HD AT4 features front and rear bumpers and a grille surround finished in body colour. The bold grille design, with its rugged texture, is finished in black chrome and set off by the AT4’s distinctive red vertical recovery hooks. The athletic interior also carries AT4-specific darkened trim, including dark-tinted and textured aluminium finishes on the steering wheel, centre stack and sill plates, as well as a unique Jet Black interior with Kalahari colour accents in the seats and live stitching. Leather-appointed seating, with mini-perforated inserts and embroidered AT4 badging on the headrests, along with all-weather floor liners, is standard delivering durability with uncompromising comfort. 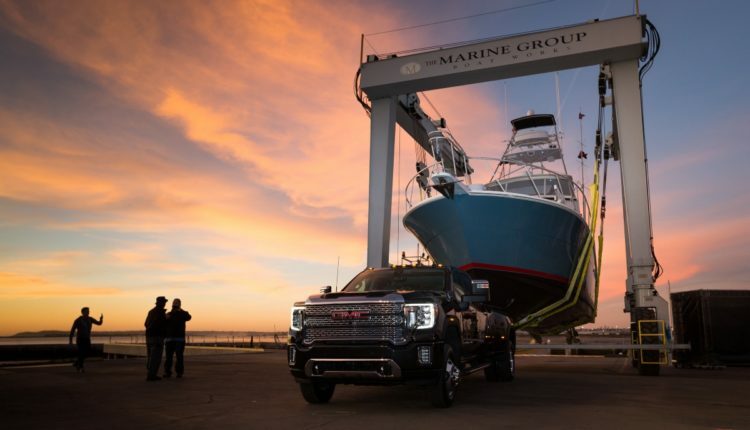 The bigger frame, stronger propulsion and smarter technologies are expected to deliver dramatically greater towing capacity than previous models, well more than 30,000 pounds. More details regarding an all-new gas engine and trailering capabilities will be announced shortly.